1 It’s impossible not to serve this at least once in a while. It’s so easy to prepare and it’s incredibly flavourful. 2 Let’s begin by getting a big pot and placing the pork knuckles in with the black peppercorns, onions, garlic, star anise and salt. Fill this with water enough to cover the meat and bring this to a boil. Reduce the heat to simmer and cook this slowly until the pork is fork tender. 3 Once the pata is tender, remove from the pot and allow to drain. One way of infusing flavour is by rubbing the meat with salt or fish sauce. Everybody wants crispy skin. To achieve that crispiness, leave the pata in the chiller overnight without cover. In this way, you just want to remove the moistness from the pata and make it dry. 4 Get a big shallow pan nice and hot. Fill it with oil and turn the heat up to medium high heat. Gently slide the pata in the hot oil and fry until brown and crispy. 5 What would Crispy Pata be without Knorr Liquid Seasoning-Vinegar Dip. And how do we do that? Just combine all the ingredients for the dip and that’s it! You may add siling labuyo to make it more spicy. 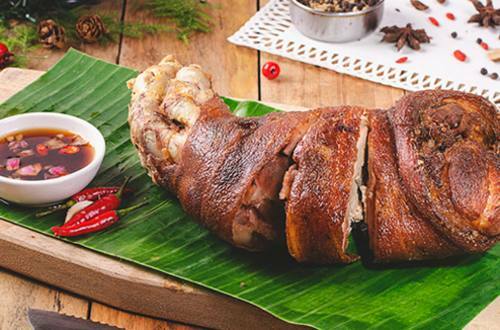 6 Crispy Pata with Knorr Liquid Seasoning Vinegar Dip is impossible to resist so make sure you have lots of space in your stomach for you will definitely indulge!